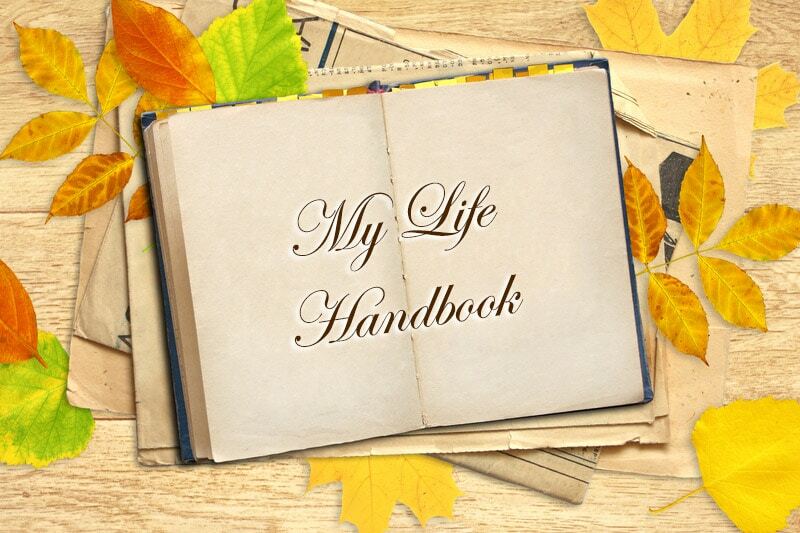 One of the tools that has been crucial in my personal growth journey is my life handbook. What is a life handbook? A life handbook is your guidebook to live your best life, consisting of everything from your life purpose to your life goals to your action plans right down to your daily tasks. Just like the Bible reflects the doctrine and creed of Christianity, your life handbook reflects the essence of what it means to be you and what it takes to live your best life. Think of it as your GPS for life. Back in 2006, I was just about to graduate from university. I had already found my passion to help others to grow, but decided to work in the corporate world first rather than pursue it right away. I promised myself to keep my passion in mind and pursue it when the time was right. Fast forward a year to 2007, and what had I done about my passion? Absolutely nothing! It wasn’t that I lost interest, but that I had been so busy working that I had no mental space to think about anything else after work. During weekends, I would either be working or recharging after a hectic work week. I also found the same non-progress in my Quadrant 2 goals like finding love, losing weight, and spending time with my family. Despite wanting to realize these goals, it was difficult to do so with day-to-day priorities screaming at me every day. I realized that I needed some kind of tool to remind me of my long-term goals while helping me live every day to the fullest. Not a to-do list, because this is only a micro-tool that will help with managing daily to-dos but not long-term goals. Not an action plan, as it tends to be goal-based (e.g. lose weight or improve work performance) and doesn’t give me the holistic view on life that I needed. What I needed was a guidebook for life. A guidebook that would consist of my life purpose, personal values, daily mottoes, long-term goals, short-term goals, and my personal life lessons. A guidebook that I could refer to every day to live my best life. This guidebook would assist me in my everyday thinking, decisions, and actions; it would also remind me of my long-term priorities so that I would always be moving toward them and not forget about them. From there, my life handbook was born. A life handbook is incredibly powerful in many ways. Firstly, having your handbook is a key step to becoming a true leader of your life. Many people live aimlessly, with no clarity of what they want to accomplish. 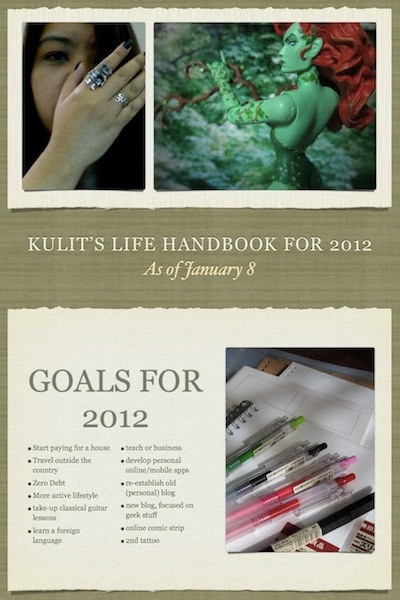 Creating your handbook forces you to reflect on your life, think about what you want, and create plans to realize them. Subsequently, your handbook becomes a crucial tool to live a life of highest purpose — purpose as defined by you. Secondly, it gives you clarity. There are so many distractions in our lives that it’s easy to get sidetracked by them. Many things that are urgent but aren’t important can often take center stage and pull us away from the things that matter. Your life handbook reminds you of the important things that matter and to focus on them. Thirdly, it is your guidebook for living a great life. Not sure what to do in a dilemma? Have a conflict that you don’t know how to resolve? Feeling a little lost in life? Well, refer to your life handbook! As you review your purpose, your values, and your goals, it helps you to reconnect with your inner self and to make the decisions that align with your highest being. Step #1: Decide on the Format. Soft Copy or Hard Copy? First decide on the format of your book. Do you want to go soft copy (e.g. Excel spreadsheet, MS Word, or Powerpoint) or hard copy (e.g. a notebook or a physical folder)? There is no hard and fast rule on which format to use; it’s up to your personal preference. Some of my clients and readers prefer a digital format for their handbook. Some prefer hard copy; they purchase blank notebooks and decorate them as their handbooks. Personally I prefer a soft copy handbook as 1) you can easily edit the information, 2) most software has functions to help you organize information readily, and 3) you can transfer it across different mediums like mobile, your work laptop, and your home laptop. I use an Excel spreadsheet for my handbook. Some PE readers have great success using EverNote and MS OneNote for their handbooks, so you can consider them as well. * For those of you who have done Live a Better Life in 30 Days Program, you should have identified most of the items above, so it’s a matter of putting them together in your handbook. While the above outline may seem a little hefty, there is no need to work on everything in one sitting; neither is it reasonable to expect that. Simply filling out one section (say, your life purpose) requires deep thought and self-reflection. Rather, take as much time as you need. Do whatever you can today, then continue tomorrow. Two weeks is a good time frame to get the core sections in place. Remember that your handbook is meant to be a work-in-progress. There will never be a point when your handbook is truly completed, because life is a journey to be discovered every day. Make it a habit to update your handbook daily, even if for just five minutes each time. 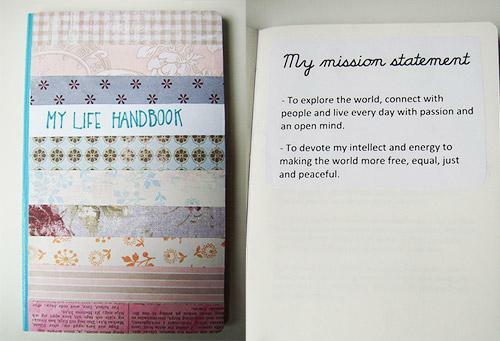 Your handbook is all about you, so personalize it! A great way to spice up your book is to decorate it with photographs and images that inspire you. For example, for my healthy living goal, I have visuals of fruits, nuts, fruit/vegetable smoothies, salads and water (to remind myself to drink enough water every day). Different sections of my Excel handbook is color-coded to facilitate my reading. No matter how many clients I work with, it’s always exciting to see how each of them puts together his/her handbook, as everyone’s handbook always turns out different. Your handbook is a representation of your individuality, so don’t worry about conforming to a certain “standard.” Rather, let your creativity flow! Because your handbook is extremely important, have at least one backup. I back up my handbook via email every month and also save a copy on my external hard drive. After realizing that I needed a tool to guide me in everyday living, I created my life handbook in the form of an Excel spreadsheet. At that time, I didn’t think of this as my “life handbook” — I simply saw it as a tool to document my life lessons. Each day, I would add to this document, edit the content, and structure the information. If I was busy I would spend five to ten minutes on it; if I wasn’t, I could spend hours fiddling away! From my life purpose, to my values, to my daily mottoes, to my long-term life goals, to my short-term life goals, I would add all kinds of information important to living my best life. Before I knew it, this innocuous document had transformed into my life manual. It was about a couple of months before I finally felt that the core foundations of my handbook was in place. Look at your handbook every morning before starting your day. Start off by reviewing your purpose, then your values, followed by your mottoes, and then your long-term goals and short-term goals. You will find that just spending a few minutes looking through your book every day will give you immense focus and clarity, which will ripple out to create dramatic changes in the long run. Refer to it throughout the day to remind yourself of your goals. My handbook is open in my computer all the time so that I can easily refer to it throughout the day. If yours is a hard copy book, carry it with you wherever you go. My clients carry their handbooks with them everywhere they go and they refer to it whenever they get the free time. Update it constantly. From now on, use this book to record any information that’s important to you. Whenever you come across something meaningful and noteworthy, record that into your book. Whenever you have a new goal, include it inside. Whenever you get an aha, record it so that it doesn’t get lost. Soon, you’ll find that it becomes second nature to update your book whenever you think of something. Back it up regularly. If you have a soft copy handbook, please back it up frequently (every month is a good interval). Be sure to check out Day 17 of Live a Better Life in 30 Days Program on creating your life handbook.